← Rumbling Heard. Vertical Line of Flickering Lights Seen. PHOTO OF OBJECT WITH 3 BEAMS OF LIGHT TRAILING. (FALCON 9 ROCKET). Description: It’s rays were like the sun shining through a hole in the clouds, but, there was no sun, no moon, and no clouds. Shortly after it appeared to be going south, with 3 beams of light trailing behind it. That’s where the video picks up. It then faded out of sight. That is when I noticed there were no clouds in the area that I had just seen this light. A SpaceX reusable Falcon 9 rocket was successfully relanded yesterday evening, after illuminating the skies above California. The rocket took off from the Vandenberg Air Force Base, northwest of Los Angeles, at 7:21 PM local time (3:21 AM UK time), Bloomberg reports. The main booster stage then returned and touch back down at the launch site eight minutes later. 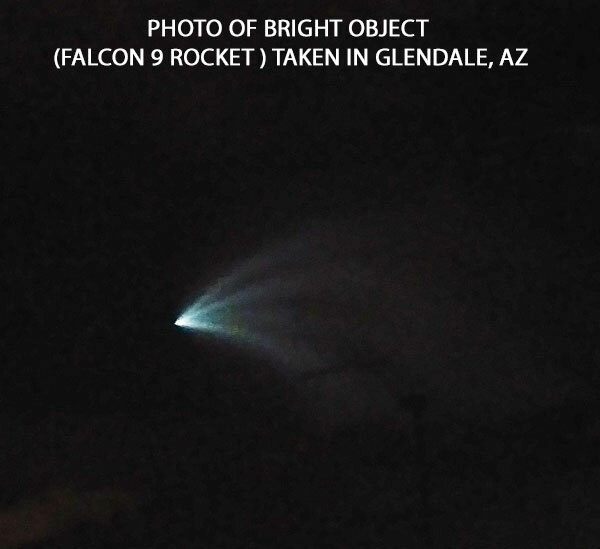 This entry was posted in bright light, Photos, Possible rocket, UFO Sightings 2018, UFO Sightings Arizona. Bookmark the permalink.